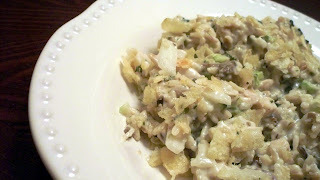 I have to admit that chicken is not my favorite meat, but I love a good chicken casserole. I have several in my repertoire and they always bring me a sense of comfort when I eat them. The recipe I'm about to share is a new addition and one that I'm bringing to a friend who just had a baby because it is a good freezable option! Typically I half this for me and my husband because it really does go a long way! I added my personal notes about the recipe in smaller font. It's scrumptious - you should try it! Do you deliver? I need something for dinner tomorrow night.